Rhiannon Newton’s Doing Dancing makes me think about being, through time. Given her interest in the way dance “insists on disappearing,” as the artist writes in her program note, it feels appropriate that the work seems to dissolve in my grip, prompting questions and ideas that too have a delicious way of slipping through my fingers. The work’s audiovisual installation is on show at Firstdraft gallery for several weeks, punctuated by three performances and/or making sessions that generate new material for it. I attend two of these. During one, Newton works alone, with Benjamin Forster operating recording and playback software he has built; during the other, she works with Forster and six other dancers. 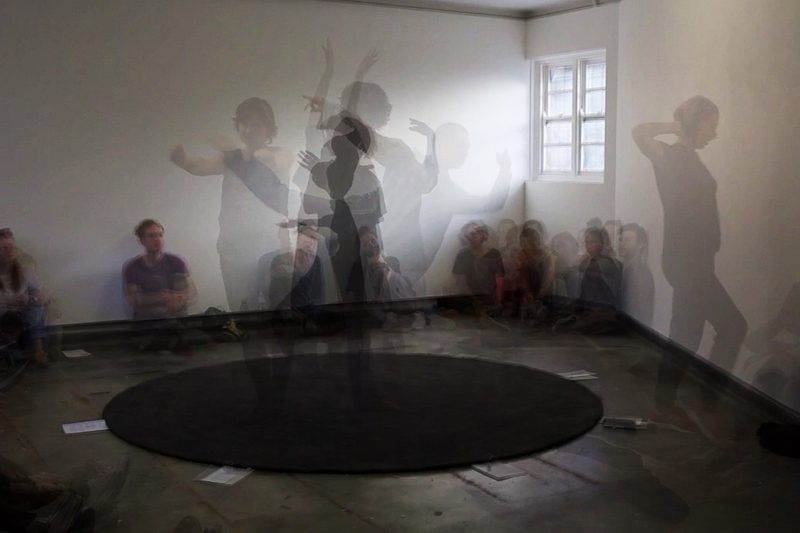 The sessions follow a repetitive, almost circular structure: a performer reads a piece by Gertrude Stein, and then improvises a dance for a set period. 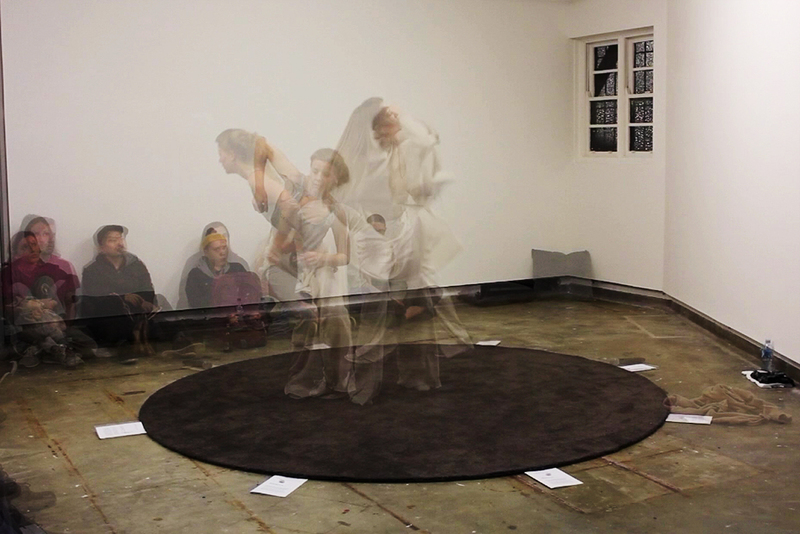 Both the reading and the dance are recorded, and the video of the dance is projected in real time onto a nearby wall. This process is repeated over and over (the Stein text almost identical each time), by different dancers or, in the solo session, by Newton herself. And with every repetition, the recordings of previous iterations are also present: we hear each reading over (or alongside) audio recordings of previous readings, and see each presently unfolding dance projected onto previous dances. The Stein text is a written portrait of Isadora Duncan, edited for this work by Newton. It is an extended cascade of phrases that meditate on being, oneness, likeness and dancing. The phrases dovetail and overlap; they sound like each other but bifurcate constantly, disorienting you just at the moment that you think you will figure out “where you are.” While the human body is so easily (and widely) understood as something solid and bounded, this text makes me ponder whether the persistent existence of a body through time might actually involve an infinite number of unique moments, and an infinite number of potential movements, actions and expressions, held tenuously together. Watching the dancers improvise their way playfully and attentively around the circular rug laid out on the cement floor, thinking-and-moving, thinking-through-moving, I find myself thinking about moving as a process of going forwards through time — of always leaving a significant ‘now’ behind you. Watching the layered video, in which so many Rhiannons spill across and away from each other, and hearing all at once the eight different ways she has spoken a particular phrase, I reflect on the single body’s ability to trace a multitude of potential dances (and pronunciations of a word) over time. Such ideas, I gather, are persistently interesting for Newton: her earlier work, Assemblies for One Body (2011), explored what “remains” of dance as we move forward through time, and how repeating a dance might allow us to examine that. The later Bodied Assemblies (2014) explored, among other things, the body’s capacity to be uniquely itself (to be radical, different), and equally its capacity to be like something or someone else. “Dance insists on disappearing,” she writes, and indeed, over time, the accruing, translucent video layers grow wafer-thin. While the projection initially feels almost as solid as another physical place, in which the present dancer is in the company of one or two past selves, it transforms layer by layer into a vast and shimmering retrospective that vanishes even as it expands. Being is so elusive, so diffuse, I marvel. And yet, watching Newton or Julian Renlong Wong or Miranda Wheen dance in the flesh, in the waning afternoon light, shouts from a nearby sports match drifting in through the open window, it strikes me that, just now, a dancing body doesn’t feel complicated at all. These dancers, who perform as themselves — who are always themselves, here with us, doing dancing — possess roundness, weight, hair and breath. They feel solid, significant, and all of this feels wonderfully straightforward. Doing Dancing gives ample space to such double perspectives. It also allows for experiences like the one I have at the end of the group performance, when the room breaks into applause and I get the strange feeling that I don’t know who I’m clapping for — or, that I’m clapping for no one in particular. Of course, on one level I know. But it feels like, in doing this work, the artists are facilitating the emergence of something else: something that is at once all of them, and none of them. The work has an inbetweenness, maybe even a vanishing, at its centre. And even so, it makes dancing, and the ‘here and now,’ feel entirely weighted, persistent, sensuous.